In one of the previous tutorials we shared a simple Recent Comments widget that displays the latest comments published on the blog posts. However, the main downside was that the widget didn't have the option to show the users' avatars. So, for those who'd like to see something more, here's a stylish Recent comments widget with round avatars and comment excerpts. Besides providing the option of displaying the commenters avatars, we'll be able to change the default image for the anonymous avatar as well. Step 4. After changing these settings, click the 'Save' button and we're done! 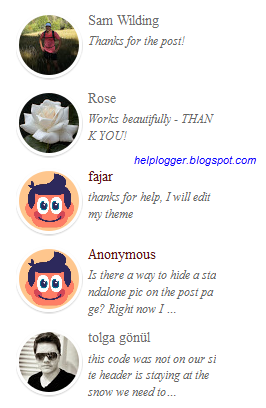 From now on, when a reader sees the recent comments widget with avatars for Blogger in the sidebar, he thinks that your blog is pretty active and that encourages him to post comments on your blog. This way, you can gather some active user base to comment on your blog posts. You can get Disqus Recent Comments Widget by logging into your Disqus account, then go to Tools tab and from there you can copy the code for your widget. got it! it works. thanks helpblogger! i can't seem to get thsi to work..
your other one works ..
it's work but why admin also in the widget ?? I see these menu items nowhere on the menu. And when I change the favicon in "layout" (on lefthand side of page) it has no effect. I cannot replace my old icon. how to exclude the blog author comment? Its work nice widget.I appreciate your post.Thanks so much and let keep on sharing your stuffs. Thanks for your code, my blog now http://facebooktopic.blogspot.com/ is more interactive and beautiful. Thanks you so much and keep the good work in helping newcomers in blogging world. Is working and is fabulous!! Thank you so, so much!!!! it works my friend... thank you so much, from Philippines..
A very useful article! Thanks. Thank you, it works on my blog. I use standard theme instead of Dynamics. Thanks for yout tips, it's cute! It works on my blog but it's not the most recent comment, any idea why? I have tried but still can't appears,,, maybe some problem on my template. I've just add this code above and it works correctly..
great tip !! keep the good work ! Works beautifully - THANK YOU! It may be that I am unfamiliar with C&P codes, but I tried to use the first tutorial and after I (Did change with original blog address) Saved and went and checked it was wrong. What I saw after clicking "Recent Comments" was a link to the tutorial. I think maybe I used to much of the code. I would like to use the code here with the Rose, but I think I need it to be broken down to what I should exactly Copy & Paste. I would appreciate any help. Thank you! May you have a Blessed 2014. Works fine in my blog except for the round part, which puzzles me. You have the option to remove the roundness of the avatars, just delete the line in red from above (I've updated my post). Thanks for visiting! Many thanks for this great widget which works well. Is there an rss feed for these comments or a way to extract and show in the widget? Thanks so killer! Thank you!! It worked perfectly -- I love the round icons and the choice of replacing the boring anonymous icon with my own image..thank you so much!! i like this blog,so owesome....!!! It looks like I can't customize this widget. I actually changed the number of comments to 6 and set the number of shown characters to 110, but it definitely doesn't show these changes. Also it doesn't show the default avatar I set, even though it leads precisely to the link of the image I want to have as the default avatar for the widget. "get this recent comments widget". By the way, thank you for this great tutorial, I hope I'll find a widget. I really like this widget, but it is not working on my blogspot, either. If I don't replace helplogger with my blog name (wingsofprophecy), I get YOUR comments - lol, but if I replace it in the html code (several places - which may be what I'm doing wrong), then nothing displays at all, except my caption, Most Recent Comments. Can you please tell me what I am doing wrong? My blog gets a mil or so hits a year, and this would be really helpful. I originally came to your page looking for a way to make most recent comments appear first on one of my pages and found this. Please add the code again, you don't have to replace any address. I hope it works now!